A few years ago I saw a snippet of a documentary on relationships. It was a snippet because my daughter was very young, I was the main parent, and for years rarely saw a whole programme in one sitting. In this documentary a very elegant older woman was talking about inviting her husband’s lover to come and live with them in a bid to hold their relationship together. That was it. That was all I saw. This didn’t sound like desperation on the woman’s part to keep a husband to herself, but more a recognition that they were older, and the thought of ending a long relationship and everything that would come with it would simply be too much. Because I didn’t get to see the whole programme (I’m yet to find out what happens at the end of ‘Noddy and the pot of gold’! ), I was intrigued to discover how it turned out. So I thought I’d write the story for myself and see where it went. It became ‘THE TRUTH ABOUT US’. The woman from the documentary I called Nell Lewis, and her husband-Gordon; a misogynistic, bigoted, retired lawyer. They are both in their late sixties and have been married for 45 years. 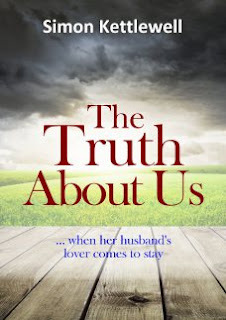 Gordon begins an affair with Cath, the daughter of a recently deceased family friend. Unable to envisage a future any different to the past she has known, Nell invites Cath to come and live with them. Cath’s personal circumstances are dire and so, much to Nell’s surprise, she accepts the offer. I don’t feel comfortable when marriage is described as an institution or some kind of club when it seems to me that every relationship is unique in its own way. I do wonder if giving marriage this feeling of commonality bequeaths it a power it doesn’t actually possess. I don’t have a problem with good quality, reciprocal long-term relationships in which respect for one another plays a major part, but marriage for those hung up on it can become I believe, something of a destructive influence with all it’s archaic connotations. For others it works, probably because within they find a happy balance, which probably has nothing to do with marriage at all. Developing older characters and getting inside their lives proved to be a fascinating exercise; especially through the eyes of this elegant, largely conventional woman who has tried all her life to do ‘the right thing’ and hold onto her marriage vows, despite her husband trashing them from time to time with his sordid and usually brief affairs. Gordon as those who have read the book will see is not Johnny Depp! More Johnny Vegas with hairy ears! Once I’d written Cath (the lover) inside Nell and Gordon’s house, things begin to get interesting. Nell is able to see for the first time, and at close quarters exactly how utterly crap, cheesy and patronising her husband is with women. This isn’t news to Nell, but to see it so starkly was fun to write, and for her to witness it first hand made it quite clear that she is to an extent complicit in making their relationship what it is. I thought I’d throw in a ‘curve-ball’ too, so I introduced John Boyd. John is a similar age to Nell and the antithesis of Gordon. This new ingredient gave me the opportunity to reduce Nell’s potential to become a victim as she develops feelings for this gentle, down to earth man. I took advice from a number of women of varying ages with this book to create the character of Nell. I did this so that I could accurately reflect her age, her generation, and also the authenticity of her situation. I was surprised how the younger women could also relate to her dilemma and the age-old patterns and pitfalls that can perpetuate an intractable set of circumstances where no one gets what they want. I called the book THE TRUTH ABOUT US because I wanted the characters to face the uncomfortable truths about themselves, and in doing so create choices, equally hard to face, but with the potential for liberation. We should all feel liberated in life. It is too short to be otherwise.